After the 2011 elections, all political parties (including NRM) concurred that electoral and political reforms were necessary in order to have free and fair elections in 2016. Proposed reforms were generated by various political formations; including, the Inter-Party Organisations Dialogue (IPOD-consisting of all parties represented in parliament), National Consultative Forum (NCF- consisting of all registered political parties and led by NRM), Citizens’ Coalition of Electoral Democracy in Uganda (CCEDU) and the National Consultation on Free and Fair Elections (NCFFE). In spite of the NRM having fully participated in the various formations that presented reform proposals to government (executive) and parliament, Mr Museveni, the final authority in NRM decided that no electoral reforms would be undertaken ahead of 2016 elections. That’s what happened. All parties and persons participating in the 2016 elections, therefore, knew that the elections would be inherently not free or fair. That’s why opposition parties and elements from the NRM were engaged in protracted discussions seeking to devise an appropriate strategy for contesting in an inherently manipulated and unfair election. This is why my candidature adopted the strategy of a Defiance Campaign. Our clear understanding was that this was an election organised on the premise of injustice. A political defiance campaign entails informing the population about the injustice and enabling the people to organise and confront the injustice. It’s important to note that a political defiance campaign is completely NON-VIOLENT. It employs well-informed citizens to non-violently challenge the injustices in the electoral process; protect against various forms of rigging on polling day; and ensure that the peoples’ will is respected. This was the purpose of the “POWER 10” system that we organised during the campaign. A lot has been talked about events of the polling days, 18th and 19th February. The main problems during voting included widespread disenfranchisement of voters, especially, in Kampala, Wakiso, Jinja, Iganga, and Mbale, with more than 2 million registered voters; arrest of polling agents; pre-ticking and stuffing of ballot boxes; widespread and systematic voter bribery; and denying polling agents their Results Declaration Forms. What is now clear is that all the injustices undertaken prior and during voting failed to deliver victory to Mr museveni. As soon the Electoral Commission begun to announce the results at the Namboole Tally Centre, the alarm-bells started ringing. It became clear that many of the results they were announcing were different from the ones announced at the polling stations. When the pattern of inconsistency was sustained, on 19th February, we decided to address the media and draw the public’s attention to this. We’d previously alerted the country about a house in Nagulu, Kampala, where, according to reliable information, manipulation of results from Districts was planned to take place. Ballot papers were also pre-ticked in this house. It was at this point that the police stormed our Party Hqs and, under cover of teargas, arrested our Party President Maj Gen (rtd) Mugisha Muntu, FDC Mobiliser Ms Ingrid Turinawe and myself. Our Headquarters was taken over, ransacked and kept under police control up to now. From 19th February (the day before the announcement of final results by EC) up to now, I’ve been under police detention- either in police cells or at my Kasangati home. Access to our Party leaders and lawyers was very limited. Several of our District Party offices have also been attacked and hundreds of our Party officials and polling agents have been detained countrywide. It is this Police/Military operation that crippled our effort of gathering evidence and evaluating it for purposes of preparing an election petition as provided for in the Constitution. The Constitution gives an aggrieved parliamentary candidate 30 days within which to petition. However, a presidential candidate who’s supposed to collect evidence from 281 constituencies, exclusively by affidavit (statement sworn before a lawyer), has only 10 days to do so. The stealing of the 2016 presidential election was so clumsy and exaggerated that the Police/ Military forces had to intervene directly to stop its exposure. Even biased courts like ours could not be relied upon to protect the fraud. That’s why the electoral process was overthrown! What happened is, for all intents and purposes, a military coup. Kampala remains under “siege”, with streets reminiscent of February 1971, in the aftermath of Gen Idi Amin coup! It may be easy to fake results, but it’s not easy to fake people’s response. There was absolutely no celebration on the announcement of the fraudulent declaration of Mr Museveni as a winner of 2016 elections. Even NRM members knew that the EC announcement was not true! I can confidently inform Ugandans that we undoubtedly won the elections. Even with the unprecedented effort of the Police, Military and Intelligence Services to deny us our results, we now have enough to go by in claiming our victory. We also discovered many clearly anomalous results- including over one hundred polling stations, in Kiruhura District, where 100% of registered voters cast their votes and all voted for Mr Museveni, without a single spoilt ballot paper!! We also have horrific accounts of what happened in the Karamoja region. In most of the region, it was a military/police/mafia operation, rather than an election conducted by EC according to the law. It’s on the basis of the information in our possession that we’ve demanded for an Independent Audit of the 2016 presidential election. This would mean that we would politically agree on a process of election audit that’s not presently provided for in the law, since the one provided was overthrown. This would, basically, mean agreeing on independent auditors and supervisors that would work with representatives of candidates and the EC to carry out the audit. All candidates would commit themselves to respect the outcome of the audit. This can be conclusively done before the expiry of the current term of Government. All peace-loving Ugandans, East Africans, Africans and members of the International Community are called upon to play a role in working towards the Independent Audit. If this is not agreed upon, then we’ll have to proceed and exercise the mandate that was clearly given to us by the people of Uganda. We cannot let down the millions of people who supported our campaign, braved the harassment and intimidation, persevered in long queues without voting materials etc, and eventually delivered the victory. We shall form government as mandated by our people- the Peoples’ Government. This is the critical moment for our political defiance campaign. Let’s all remember that Government power comes from cooperation, submission and obedience of the population. If the population withholds it’s cooperation, submission and obedience, the government loses power. I ask all our people to remain strong and vigilant, especially, members of Power 10. We shall call for non-violent actions that disempower the regime seeking to impose itself on our country. We may have to make some sacrifices and should be prepared to do so. I am confident that our people’s resolve to have non-violent change of leadership for the first time will become a reality in 2016. There been yet another day of Presidential Rallies. There been more movement from all candidates. NRM continues… Go-Forward and Amama Mbabazi has had a hectic day. The FDC team and Dr. Kizza Besigye have been in Busoga… the other candidates were there also on the trail… Let’s continue! He continued to travel in the Northern Uganda on his trail. And the UPC candidates continue to support NRM like they are the same party. Akena must sit somewhere proud. Otunnu must be sad somewhere else… Milton Obote be pissed at his son somewhere in his eternal rest. Well, let’s go back to the trail! “We are in alliance with the UPC” said today by Yoweri Kaguta Museveni. Also saying today: “Whoever who ate that money, going to vomit” (…)”Some problems in the Health Ministry – Corruption, Stealing drugs”. Before his campaign rally in Hoima the police has thrown out tear-gas to scatter the public who was supposed to go the venue where Amama Mbabazi. On our agenda for 2016-2021 shall be revisiting land compensation for those who were not compensated for loss of land during the oil exploration exercise. This will be resolved. Additionally we intend to empower local governments to manage their own budgets for infrastructure development especially municipal roads”. Sunday 22nd November 2015 is the new date set for the release of the Go-Forward and TDA joint manifesto release. The race has been halted by the issue that the professor doesn’t have the money for his campaign. There it has been postponed. He has been steady tweeting all day! The Joseph Mabirizi and Maureen Faith Kyala were scheduled to have rallies in Butaleja and Kibuuku District today. Abed Bwainka had today campaign rallies in Iganga, Kamuli and Namayingo. He has been talked in Irudu in Buyende district. Later he had rallies in Bukungu. “We shall improve agriculture. We shall invest in research, promote irrigation, establish a farmer’s bank, insure gardens. We shall also fix prices so that any farmer knows that u can’t sell below that price. We shall have silos”. “We want to thank the people of Buyende and Kamuli for the warm welcome to Dr. Kizza-Besigye Wrn. He discussed with them how the Fdc govt will solve the problem of poverty thru putting in place people centered programs and projects. We implore you to go door to door and spread the message of Liberation. Kigwa Leero”. “I can confirm that we are in talks whereby the core UPC minimum agenda that addresses key issues like health, education and agriculture will guide all engagements over the next 5 years. As UPC we firmly believe in the need for a peaceful transition and recognise that this could only be the last term for President Museveni and therefore any meaningful transition cannot exclude him and NRM from this transition. UPC from its founding as political Party, sought the preservation of national unity and integration which remains a key guiding principle” (…)”As the UPC President, I am committed to abide by the National Council decision to build the party from the grassroots in preparation for the 2021 elections. I am similarly urging all UPC members to actively support and campaign for UPC candidates contesting for elective positions from LC I to Parliament in the 2016 elections”. Written by UPC President Jimmy Akena. “Broadly why are we amending the kcca act law? In 2005, Article 5 of the Constitution was amended to reflect the special status of Kampala as the Capital City of Uganda, which means that Kampala ceased to be a district under the Local Government system, and that the Capital City was therefore to be administered by the Central Government. That provision is in the constitution and its supreme. Any other law made under the same constitutional provision must not contradict it or attempt to undermine the spirit of the constitution framers in as far the administration of Kampala is concerned” (…)”The objective of the aforesaid constitutional amendment was to introduce reforms to the governance of the Capital City in a bid to address the numerous issues that Kampala faced at that time, for example poor transport infrastructure, traffic congestion, uncontrolled developments, flooding, unregulated transport industry, illegal street trading, corruption, poor service delivery etc…” (…)”In order to give effect to the new status of Kampala under Article 5 of the Constitution, Parliament enacted the Kampala Capital City Act, 2010 which came into force on the 1st of March 2011. The provisions of the Kampala Capital City Act 2010 prescribe, among others, the administration of Kampala by the Central Government, the establishment of the Kampala Capital City Authority (hereinafter referred to as the KCCA) as the governing body of the city, the composition of the Authority, election, removal and powers of the Lord Mayor, Deputy Lord Mayor and members of the Authority” (Tumwebaze, 16.11.2015 – Press Statement). “Police arrest 20 youth with sticks in 2 vehicles moving towards Rubanda, Kabale. This happens as the NRM Primaries is underway” (CroozeFM News). Conservative Party is set to expel their leaders Ken Lukyamuzi. The Independent Coalition, TIC, condemns in the strongest terms the police shooting of a Delta TV journalist on duty. Thus occurred during another blatant attempt to stop the Lord Mayor from leaving his home to exercise his democratic rights, who was also illegally arrested. TIC calls upon the Uganda Police Force to remember that they are expected to be non – partisan. I think this was enough for today, a bit better then yesterday on the trail. Peace! Fifth day of Presidential Rallies with issues between the Media and the NRM + KCCA saga continues. Today it’s the fifth presidential rallies in Uganda. The first working week is over and the rallies will continue. Yoweri Kaguta Museveni is not riding in military vehicles, instead sending the NTV packing for their so-called biased views on the rallies. Then he does love the New Vision today who had a 5-page special on the NRM. There more deflections from the party. I will not spill all the beans. So keep on reading! Museveni expels NTV from his media team after what he called unbalanced reporting on him. As per now, NTV journalists are being escorted back to Kampala by soldiers of the Special Forces Command. Daily monitor was also warned of a possible closure should their reporting continue to ‘favour’ the opposition ‘against’ Mr. Museveni. Dr. Livingstone Sewanyana needed to have dialogue with the media houses of New Vision and Bukedde about the current concerns the coverage of the campaigns. Dr.Sewanyana is a member of CCEDU, so he surely wanted to discuss the 5-page piece directly on the NRM rallies yesterday and not much about the other parties in that paper today. Yoweri Kaguta Museveni had a rally at Omuge School in Bala Sub-County. Where he said: “Government to set up and maintain boreholes”. NRM campaign in Kole South there was even UPC Officials was endorsing the President. At Benson Ogwal Obua the UPC spokesman has told the NRM Caucus and at the Rally that the UPC votes in the Lango Sub-County should vote NRM. Jimmy Akena of the UPC said this about TDA today: “Our instance on lowering our flag at TDA offices was because we hadn’t agreed to join the alliance. Party hadn’t agreed” (…)”I can’t make a decision on behalf of the UPC. Such decision are made by the party. Currently, we’re listening to both sides” (…)”We are listening to all voices. Our purpose in this election is to restructure the party and target 2021” (NBS TV). He had a rally at Apac. “About 200 angry supporters of the ruling National Resistance Movement in Mbarara district this morning denounced the party and proclaimed support for the Forum for Democratic Change” (…)”The supporters led by Bitekyerezo’s chief campaigner Polly Katwiire gathered at Mbarara independence grounds before the Deputy RDC Jimmy Kateera and started destroying their party cards” (…)”They accused Chairman Jomo Mugabe of altering the election results and going ahead to publicly brag about it” (Nahamya, 2015). “More NRM party members, including councillors from Masaka sub-region, have defected to the Go-Forward camp, declaring their support for Mr Amama Mbabazi’s presidential bid” (…)”Among the defectors were Dr Shanon Kakungulu, who represented Masaka Municipality in the 6th Parliament on NRM ticket, Ms Salama Nakandi, Bukomansimbi District speaker, and Mr Andrew Mutebi, the youth councilor” (…)”Others are Mr Daniel Ssejoba, a councillor for Lwabenge Sub-county in Kalungu District, Mr Raymond Sserunkuuma, an aspirant for the Masaka Municipality MP seat and Mr George William Bbuye. The political wave also snatched Hajj Musa Mutebi, the FDC chairperson for Lukaya Town council” (Ssekweeyama, 2015). «How can 19 women die every day and then u find women singing no Change? That would be singing no change to your grave”. “We will reduce the cost of administration and do away with unnecessary expenditure. We will not have RDCs and, Presidential advisors. We shall only have 20 cabinet ministers and 20 state ministers. These ministers will be the presidential advisors. After we have cut the cost of public administration. All that money will then be brought to service delivery. Why should we have a parliament of 400 mps?! Only 150 ‘mps can be enough”. FDC’s Kizza Besigye at Katovu…now headed to Mpumudde for the first rally of the day. “Thank you Lwengo and Lyantonde for receiving us, we appreciate that you are all fired up to usher in the change we all deserve. ‪#‎WesigeBesigye”. Today Maureen Faith Kyala had a campaign together with Elton Joseph Mubirizi was in Luuka and Namutumba. Abed Bwanika held his rallies in Jinja district today! “My government will be a government of action, not a government of hoodwinking farmers every year with promises of NAADS funds”. He had his campaign in Bugisu today and also in Sironko and Mbaale. “2016 presidential candidate Venansius Baryamureeba says campaigns will slow down the economy because Ugandans are staying away from work to attend rallies. Professor Barya cites this as reason behind his decision to suspend rallies and resort to door-to-door engagement, online — especially Facebook and Twitter — and broadcast methods of campaigning” (NBS TV). Amama Mbabazi said this today: “Land grabbing is a problem in Uganda”. “Thank you Luwero for welcoming me with open arms. We must continue to engage on issues that affect the community. Once again I would like to emphasize that we must tackle issues of veterans compensation; Forward linkages especially agro-processing of the main crops in the area (pineapples and oranges), cooperatives especially with regard to financing of agriculture as well as having adequate Health Centers 3 and 4 that serve the community”. IPOD the platform where all parties that have representation in Parliament NRM inclusive is holding a special Council meeting today at 2pm. There will be a by-election in Rwampara in Mbarara District, after Vincent Kyamadidi contested the NRM Primaries and the earlier polls in the region. Nominations of Lord Mayor and deputy hopefuls previously slated for November 16. 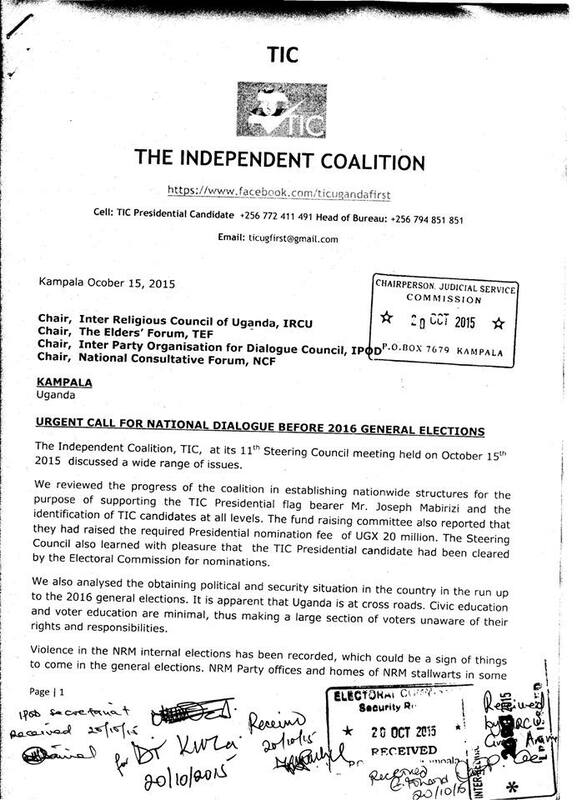 This is deferred to the Minster of the Kampala is yet to guid the Electoral Commission. “I picked the nomination forms for the position of the Lord Mayor a couple of weeks ago and set out to collect the requisite endorsement or signatures from the voters. On Wednesday this week, I proceeded to the EC offices and submitted the duly signed forms to the Kampala District Returning Officer, Charles Ntege, and booked my nomination for monday 16th November at 11:00am. Once that process was set into motion, Mr. Badru Kiggundu exhausted all his powers to reverse or halt it, and, accordingly, he is not at all seized with prerogatives to call it off on such spurious grounds that he is waiting for the enactment into law of what I would aptly term as the ”LUKWAGO BILL” that was tabled in parliament by Hon. Ruhindi . I wish therefore to inform all and sundry that our nomination programme is still on as earlier arranged”. There been actions and quotes after the start of elections-season in Uganda. The campaigning will not start officially before Monday 9th of November and end 18th February 2016. Still there already campaigning and movement from all parties involved. Even the ones paid to secure the elections and the ruling party. The last report I have to is a continuation of the fear-mongering the President Museveni does. It’s his trademark now. Just like Nike – Just do it! For Museveni it’s if you don’t get me to keep the throne then the guns shall arrive and you will regret trying to get rid of me! “I was not disappointed by the comments made by President Museveni when he asserted that I am a young boy who failed to manage Makerere University and that he doubted my capacity to manage this country. It only affirmed my impression of him as a person who is of advanced age and has no more capacity to keep tabs of what is going on and has no idea what is happening on the ground in Uganda” (…)”Of course I know that President Museveni has grown very intolerant of anybody who threatens his hold onto power. It is the reason that he has gone an extra mile to forget the above as seen in his attacks over my personality” (…)”To avoid going back and forth on this discussion, I would like to offer myself for a public political debate with H.E President Yoweri Museveni as we ponder on issues that affect Ugandans and not each other’s ages. It is in such debates that we can be able to engage in mature politics”. “I thank those thousands of Ugandans countrywide who signed our nomination forms, without expecting anything in return. This showed us that in Uganda, despite the culture that the 30 year old regime has attempted to impose on Ugandans – that votes are for sale – has not quite taken root. We are confident that this spirit will continue during the election period and beyond. We appeal to all Ugandans to reject voter bribery in all its forms, now and in the future” (…)”I have walked on foot when I had no transport fare. I have struggled to make ends meet. My relatives live in the villages, some work in markets, in garages, others are drivers- name it. Many of my young relatives are un-employed yet educated. I am just a hard working person who believes that with courage and determination, everything is possible. And I will be president of Uganda. With your support” (…)”To all citizens, the time for real change is now. We hear people talk about change” (…)”They have failed the young people. They have failed the women. They have failed the persons with different abilities- they have instead exploited them, manipulated them, given them empty promises and misdirected the nation. We pledge to return Uganda to its rightful path. Change can only come with new people, with new thinking. New attitudes. Don’t be deceived. No one can be able to make any meaningful contribution to governance after 30 years in power, whether as president or in any other capacity”. Today, the minister for Presidency and KCCA, Hon. Frank K Tumwebaze has handed over nine brand new Isuzu double cabin pickup trucks to the RDCs of Karamoja and Rwenzori regions.The vehicles valued at 145m each were handed over to the RDCs of Abim, Napak, Moroto, Nakapiripirit, Kaboong, Amudat, Kotido, Kamwenge and Kasese districts at a function graced by the Secretary, Office of The President, Ms. Deborah Katuramu and the media.The minister reminded the RDCs about their constitutional mandate under Article 203 of monitoring government programmes both at central and district levels. While the Secretary warned the RDCs from misusing the vehicles, urging them that punitive action would be taken against anyone who uses the vehicle for any other work besides monitoring. You made a loud and clear statement yesterday! Thank you the people of Kampala, thank you the people of Wakiso, thank you the people of Buganda, Northern, Eastern and Western Uganda. Thank you for loving FDC and our charismatic leader Dr. Col. Kizza Besigye – flag bearer. The journey to bring change has just started, we can not however accomplish this task alone as FDC and or opposition, we equally need everyone including but those in NRM who are pro change. By this we call upon all peace and democracy loving people iregardless of their political affiliation to join hands with FDC to bring about the desired change. Let us exhibit maturity, respect and tolerance even with those with contrary views. Lets convince one to convince another. Together We Can and each one of us matters. Yesterday I called the Kizza Besigye nomination event organizers Semujju Nganda and Kikonyogo John N to confirm my attendance at the nomination rally at Nakivubo. There is no way I could not be with my FDC colleagues on this day. I had really wanted to put the record straight,- that not all JEEMA leaders put their weight being Rt. Hon. Amama Mbabazi (Go-Forward) as is alleged. Those JEEMA officials who have declared support to JPAM did so as individuals, which is their absolute right, especially since JEEMA did not find it strategic to field a presidential candidate in 2016. As some of you know, business to do with “flag bearer” is disposed of only at the JEEMA National Delegates Conference. This was not done. Unfortunately, I failed to make it as I could not navigate through the jam, for, at 2.38pm I was also nominating a new kid on the block fronted by The Independent Coalition, TIC. His name is Joseph Mabirizi, Engineer, 40. It took us another two and a half hours to return to Kampala. My reasons for participating in introducing this new face in Uganda’s politics in 2016, whose real political future lies certainly beyond 2016, is ideological. A new generation should be assisted to put its foot forward now, so that they can book their place in the future, at the highest table. My personal support for FDC’s Kizza Besigye is rooted in a rich history of trust, respect and common danger that we have faced as change agents at the hands of those whom we know very well. I also know that many other JEEMA members and leaders do support FDC’s KB for 2016. God willing, I will find time at another FDC’s KB public event to repeat these words – and perhaps more, to a wider audience. This is my promise. JEEMA delegation in the Inter Party Organization for Delegation (IPOD). “Crowd goes wild as Kattikiro, Charles Peter Mayiga introduces Kizza Besigye to Ssaabasajja Kabaka of Buganda Kingdom at the youth day celebrations in Kasangati, Kyadondo” – Reports say today! Hey statesmen and women of the great nation Uganda. In my last article I clearly showed you how Amama uses media to claim to be a billionaire yet he has money just enough for his family. Yesterday we learnt that Amama Mbabazi was trying to seek sympathies from the public as his team claimed that he couldn’t access his account to facilitate campaigns and yet calling for support by donating via mobile money. Amama got this from Kizza Besigye but for the money he got from Gay activist and then Temangalo Scandal. Ugandans are wise Amama is not going to fool us. “A MAJOR REBELLION and SPLIT has finally broken out in THE GO FOWARD camp with seven chief mobilisers on the run having swindled 10BN CASH meant for strategic mobilisation! Thousands of GO FOWARD loyalists continue to storm plot 28 nakasero and vow to crush the chief robbers! In a sphere of national confluence we do urge all political practioners to exercise moral prudence, when managing the financial infrastructure of their organisations! And to you chief professional robbers in the GO FOWARD CAMP, please be reminded that your chronic culture of stealing money was well inherited right from the time when you served in the MIGHTY NRM GOVERMENT, a matter worth no indelible suprise! thank you” (Reports say). “Junior minister for Lands Idah Nantaba has been flown to Aga Khan Hospital in Nairobi for specialized treatment after police subdued her with pepper spray following a confrontation at Kayunga Police Station in the chaotic NRM primaries”. “80 crime preventors, along with their counterparts from Nwoya and Amuru, are protesting for allegedly having hoodwinked to join the M7 nomination rally on 3rd November. They were ferried from their training grounds with hopes of being passed out, ending up in Kololo!” (Reports from Gulu say’s so today!). “Minister of state for Internal affairs, Honorable James Boliba Baba has today launched twenty seven (27) regional Joint security Operation Centers with the aim of further enhancing crime reduction & management at a regional level. These centers will work hand in hand with the security teams within the districts. The regional centers will also work very closely with the Joint Operations Command center at the national level. The function took place at police headquarters & was attended by representatives from UPDF,UPF, UPS, ESO,ISO, DPP. All regional Police commanders were in attendance. The launch was also attended by Mr Stephen Kagoda, the P.S Ministry of Internal affairs”. “Uganda’s President Yoweri Kaguta Museveni has warned Ugandans to prepare for a war if they don’t vote him as president comes 18th February 2016. The president was addressing the nation at statehouse Entebbe and he clearly stated that Ugandans must vote him or prepare for a war” (AfroReports, 2015). Hey! What do you think, wasn’t that all enlightening and giving you a feeling for what is happening and the results of what is going on. There are massive moments and the camps are preparing their campaigns and everything. They way of addressing and deflections, not to mention the state giving police more fancy equipment right now before the elections and also starting joint operations between the security agencies while the President Museveni have to reassure the people what will happen if they don’t vote for him! Something is smells fishy! While the Harmonization of campaigns have been done the Electoral Commission and the days are scheduled and the document is able to get for free on Scribd. For those who are interested. In this days the manifestoes can also be read. But trust me; it is more interesting to see the movement on the ground then empty promises. Peace!